You’ll have to excuse the media and content team at the Vikings Entertainment Network (VEN) for feeling like kids in a candy store. Have you seen their new home? This summer, the Minnesota Vikings are placing the final, dramatic exclamation point on the complete reboot of their franchise: Twin Cities Orthopedics (TCO) Performance Center. First came U.S. Bank Stadium, then came the first NFC North title in six years, and now comes this stunning new practice facility in Eagan. It’s jarring to recall that, not that long ago, this franchise was in the crosshairs of relocation. Now it has one of the most impressive headquarters in all U.S. professional sports. And media and video production is a significant piece of the pie. The crown jewel of the new media facilities is TCO Studios, an eye-popping set that rivals many studios in any end of the sports-media business. 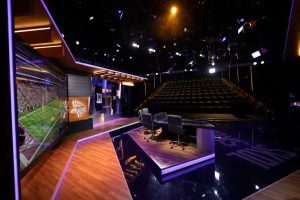 It features four shooting areas: a traditional anchor desk, an informal area with four lounge chairs for deeper conversations among talent and guests, and two standup positions — one with an 86-in. touchscreen, the other with three slim vertical video screens. The studio is filled with Sony F55 cameras equipped with Fujinon lenses, features a cutting-edge acoustic wall that lifts to open up to a 170-seat theater for a live audience, and is fully flexible and customizable (lighting, backdrops, set-piece positions) for any show, client, or sponsor. It’s an awe-inspiring site for anyone who’s ever worked in sports television. The control room — which operates TCO Studios, the radio/podcast studio, the practice-field videoboard (a 1080×600 15HD-pixel-pitch Daktronics board), and the full IPTV system throughout the complex (installed by VITEC) — is designed to replicate the control room at U.S. Bank Stadium in Downtown Minneapolis. According to Allan Wertheimer, senior manager, production, Vikings, that was done purposefully to allow seamless staff training and make it easy for new members of the team to get accustomed to the equipment by using it on a regular basis. A Ross Carbonite production switcher anchors the infrastructure at the front bench, with Ross Xpression as the graphics engine. An Abekas Mira provides playback support with eight channels, and the team has left room for growth to add slow-motion replay. For now, it can rent that gear and easily plug it into an available position. The entire media center is built around a robust Evertz router. TCO Studios features an acoustic wall that can be lifted to open the set up to a 170-seat auditorium. The Vikings worked with numerous key partners that helped TCO Studios produce its feats for the eyes. Provost Studio — a high-end, boutique design firm that has worked with the Chicago Bears, Cleveland Browns, and soon the Detroit Lions — played a chief role in design of the studio area. It also helped future-proof and properly plan the build to ensure that every element of the final project was considered. Alpha Video served as integrator, with the Vikings receiving counsel from SH Acoustics on the cutting-edge wall that separates the 170-seat theater from the set; Lighting Design Group, which set up an LED system that allows customization of the set to serve even non-Vikings clients; Chicago Scenic, which provides the set’s dramatic backdrops (right now, it’s a view of the Downtown Minneapolis skyline); and Primeview, which supplied the various screens that appear on the set, including a 3×3 video wall behind the main desk, a monitor wall behind the couch area, and the 86-in. touchscreen. The facilities are yet another example of how sports teams are investing in becoming, essentially, their own media companies. Whether it’s game day or any other day, the possibilities seems endless in this new playground. Planning for these studios began three years ago. Harper and Wertheimer credit their colleagues at the Chicago Bears and the Dallas Cowboys — whose studios and facilities at Halas Hall and The Star, respectively, are standouts — who opened their doors to tours and helped the VEN team learn from their experiences. 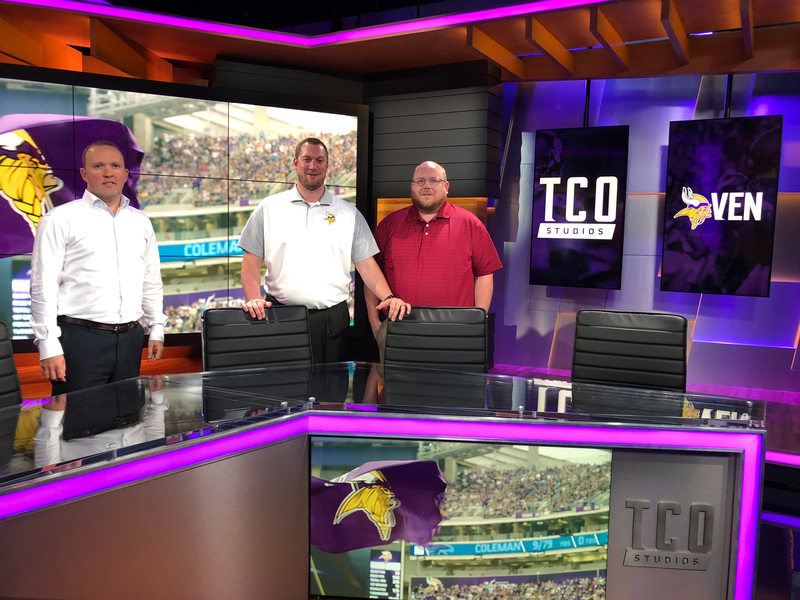 The team at Vikings Entertainment Network understands that with these amazing facilities certainly comes an increase in expectations, both internally from ownership and externally from fans. TCO Studios features four shooting positions, including this casual, four-seat lounge area for deeper conversations with talent and guests. In addition to a seemingly endless stream of content from web, social, and OTT platforms and department programs, VEN also creates six television shows for linear partners KMSP (the local Fox affiliate) and Fox Sports North (the local RSN). Although Harper acknowledges that 2018 will be a growth year, plans are in place to introduce new content. He sees the biggest areas for growth in live social media and in podcasting. 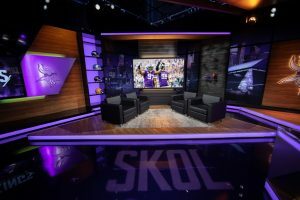 A notable addition, however, will come on the traditional linear side: plans are in place for a live show that will air on KMSP this season on Thursday nights prior to the start of Thursday Night Football, which, this year, moves over to Fox Sports. 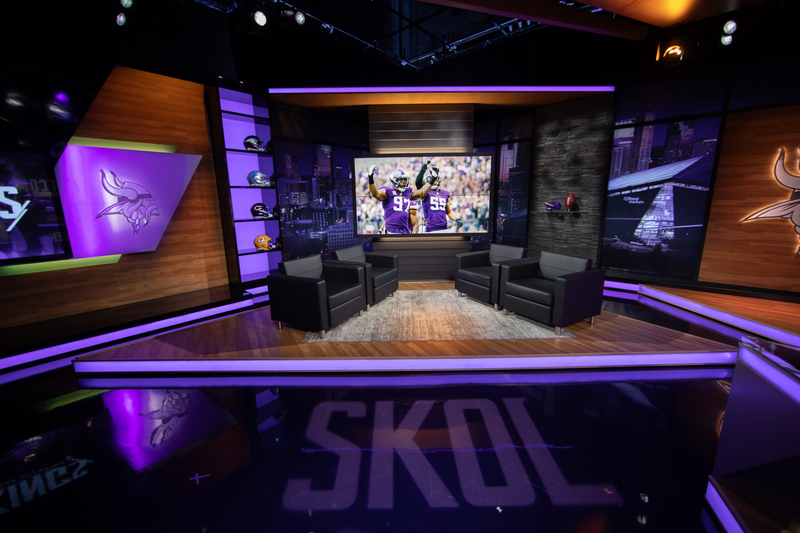 The show will be Vikings-specific and preview the upcoming weekend’s Vikings game and serve as lead-in with a local flavor to that night’s national telecast. And as it happens, the first game in the Fox Thursday Night Football package has (you guessed it) the Vikings visiting the Los Angeles Rams on Sept. 27. So, as plastic is still being pulled off new corners of TCO Performance Center this summer and that new-studio smell is wafting warmly to everyone at VEN, the excitement is clear. But make no mistake about it: the fun is just getting started.